Men in Black III opened last week in China to a stellar $25 million box office tally over 3 days, marking the second biggest opening weekend in China this year after Titanic 3D’s massive $58 million April debut. Men in Black’s first place showing also marked the 19th week in a row that a Hollywood film placed first at the Chinese box office, and the fourth week in a row in which at least the top three films were American. The last time a Chinese movie topped the charts was the second week of January, when The Great Magician (actually a Hong Kong-China co-production) had no foreign competition, as there weren’t any Hollywood films at all in wide release at the time. In fact, the last time a newly released Chinese film opened in first place in China was when The Flowers of War (also a Hong Kong-China co-production) did so in mid-December, 2011. Again, there were no Hollywood films in wide release at that time. To find the last time a purely domestic Chinese film topped the box office we must go back to mid-November, 2011, when the romantic comedy hit Love Is Not Blind was champ. For the year so far, the 12 Hollywood films that were released wide have taken a 64 percent cumulative share of China’s national box office. 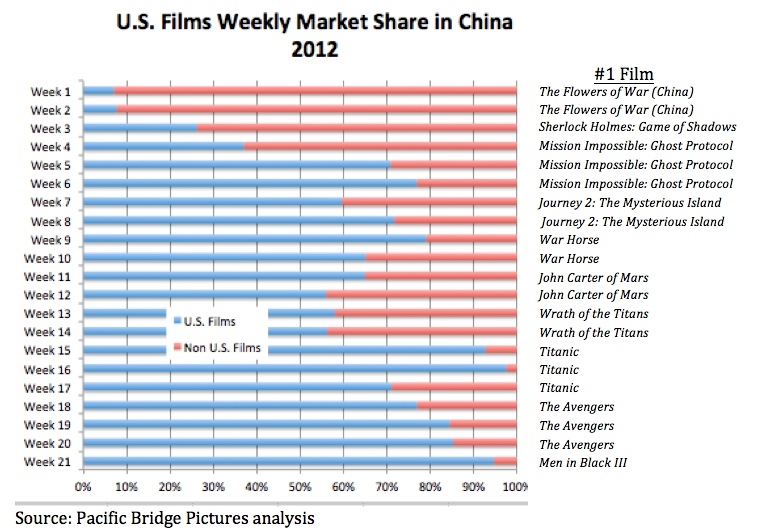 The roughly 50 (depending on how they’re defined) Chinese-made films have taken a cumulative share of only 17 percent. But if we count only from February onward, when Hollywood films were actually in release, Hollywood’s share was 77 percent. While this trend of increasing Hollywood dominance bodes well for the American studios, it also raises the question of what Chinese filmmakers, and the Chinese government, intend to do about it. With the import quota now increased from 20 films to 34, it’s a dead certainty that, at least in the short term, Hollywood’s dominance of China will continue, and very likely increase. Of course, Chinese distributors and government movie tax collectors are reaping a huge bounty on all these American films, but anyone taking the long-term view must realize that things can’t continue this way for very long. The State Administration of Radio Film and Television (SARFT), China’s powerful government overseer of media, is bound to speak out against the accelerating influence of “western cultural values” among the populace. The political implications of Hollywood’s colonization of China’s movie theaters are far too vast to be ignored by anyone, least of all SARFT. If and when it decides to act, SARFT can adopt one of two approaches in response to the American cultural ‘invasion.’ It can either choose what I call a constraining strategy, or it can go with an empowering strategy. Under the constraining strategy, SARFT would limit Hollywood movies’ access to China’s distribution channels. Although China is legally committed under WTO rules to allow foreign films into the country, there is no law that says what kinds of films must be imported, how long they must be made available to audiences, or whether they must be allowed access to the best quality venues and distribution networks. So, for example, SARFT might decide to allow fewer Hollywood blockbusters into China, and choose instead to release more documentaries, or more movies from India, or Iran, or North Korea. This would be a perfectly legal, WTO-compliant method of reducing Hollywood’s dominance. Or SARFT could also limit the number of theaters each film release would be allowed, or perhaps it could even designate that certain ‘quality’ theaters be reserved for Chinese films, while Hollywood films would be ‘ghettoized’ to lesser theaters. Although this sort of approach wouldn’t be good for anyone (except possibly the North Korean film industry), it’s not hard to imagine SARFT adopting some of these tactics because they would be relatively easy to implement and they would have an immediate impact. Sure, China’s theater owners and moviegoers and Hollywood’s studios would raise a stink, but China’s government has repeatedly demonstrated its willingness to withstand and even ignore pressure from foreigners and from its own citizens alike. The downside of this constraining approach is that it would only mask, but not solve, the fundamental problem, which is that Chinese films are unable to compete with American ones. For SARFT to solve this problem it would need to think more creatively and more constructively, and commit to what I call an empowering strategy. The empowering strategy would take the long-term view of creating value, as much as possible, for everyone involved. The highest goal of this approach would not be to limit Hollywood’s market share, but to maximize China’s, by empowering its film industry. This approach would reduce the burden of censorship, allowing Chinese filmmakers a broader palette of storytelling options to put them on more equal footing with filmmakers in Hollywood and the rest of the world. It would subsidize and support China’s artists and visionaries with story development and filmmaking grants. And it would provide bridges, rather than obstacles, for the world’s best filmmaking talents to come and work in China and help develop the country’s next generation of writers, directors, producers and other filmmaking artists. This sort of empowering approach may seem like a utopian dream, but in fact a strategy like this worked beautifully in China’s neighboring country, South Korea. Through the 1990s Korean films held only a 15 percent share of their domestic box office. But under a 5-year government-industry cooperative plan implemented in the mid 1990s, Korea eliminated many of its censorship strictures, invested in training and facilities, created a financial infrastructure that supports film production, and provided grants to writers, directors and producers to kick-start what swiftly became a world-class national cinema. By 2003 Korean films captured a 53 percent share of their domestic market, and Korea became recognized as a major filmmaking and cultural hub for the rest of Asia. There’s no reason why China can’t accomplish a similar feat. The entrepreneurial spirit needed to drive film production is already abundant in China. The country’s talent pool needs to be further developed, but it is ready and waiting, and there are plenty of qualified foreign experts willing to jump in and help them. And the money to support an empowering strategy is plentiful—far more money is skimmed by theaters off the top of box office receipts each week than would be necessary to support such a plan. The main thing currently standing in the way of China’s cultural competitiveness is the Chinese government. This entry was posted in Uncategorized and tagged China box office, Korean 5-year plan, Korean film industry, Men in Black 3, Pacific Bridge Pictures, Rob Cain, Robert Cain, SARFT, The Flowers of War, U.S. share of Chinese box office by chinafilmbiz. Bookmark the permalink. “Colonization” is a poor word to describe the success of American films there. Looks like you are just looking to write about something. The Chinese will control whatever they want to control…until progress catches up to them and they cannot strong arm their central government policies into effect. That is a long way off. Jim, “colonization” is admittedly a loaded word, but I chose it deliberately, as I think it fits the circumstance. Hollywood films have landed on Chinese soil and taken over. If the Chinese government was fully in control there is no chance that they would allow Hollywood a nearly 80 percent (and rising!) share of their domestic box office. They can’t kick the colonists out without breaking international laws, but they can change the game in either of the ways I’ve suggested in my article. From the point of view of the Chinese government, harmony/stability is more important than the influx of western culture. The domestic movie industry simply cannot provide the type of escapism for which Hollywood is well-known. Simply put: better entertainment means fewer revolting peasants. Their government won’t be cracking down on pirated movies or music anytime soon.